Let’s take a brief look at what the witnesses heard, and how they heard it. The John McAdams site breaks down the locations of shots according to different sources. It also provides a tabulation (by Joel Grant) of the number of shots that witnesses heard, showing that “81%” heard three shots. 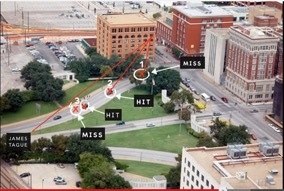 This pie chart would seem to indicate pretty conclusively that there were only three shots heard in Dealey Plaza. However, it is misleading. 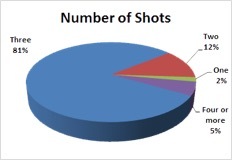 It probably counts witnesses who heard “at least three” or “three or four” shots as having heard “three.” There is no category for “at least three” or “three or four” on the chart. Nor do we have the source for the witness accounts (Warren Commission testimony? Sheriff’s Department affidavits? Newspaper accounts?) to verify the information. Nor does this chart take into account the timing of the shots that witnesses heard. 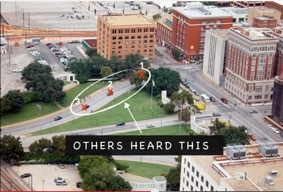 By combining the two different three-shot witness accounts into a four-shot scenario, as the poster of the YouTube video notes, the result is exactly what witnesses like S.M. Holland and Austin Miller heard. This scenario also accounts for witnesses who heard “at least three” or “three-to-four” shots. In fact, news reports from the day of the assassination stated, “When the shots were first fired, there were thought to be three, but was later confirmed there were four shots.”  Note that these same reports also stated that a Secret Service agent was killed. It wasn’t a Secret Service agent who was killed, of course; it was Dallas Police officer JD Tippit, and I believe the confusion was caused by Hickey’s falling over “like he was shot, too” (per S.M. Holland’s statements) but the reported confirmation of four shots is certainly worth attention. A four-shot scenario can reconcile the two different versions of the three-shot scenarios. In fact, a four-shot scenario also accounts for witnesses who only heard two shots. How can four shots sound like three? Or two? As the McAdams site notes, more witnesses heard fewer than three shots than heard more than three shots, although a handful of witnesses (e.g., Jean Hill) did hear more than three shots. S.M. Holland heard “four” shots. Jean Hill heard “five or six” shots. In fact, Jean Hill’s recollection of “five or six” shots exactly matches the acoustical evidence. So what can account for th is wide discrepancy among earwitnesses? Additionally, the mis-perception of “echoes” could have caused many people to believe that a separate sound was simply an echo of an earlier sound rather than separate and distinct shots. This is why the acoustic evidence, if valid—and there is reason to believe that it is valid—is so important. 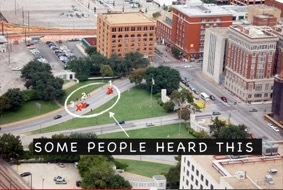 Even if one does not accept the results of the analysis that “proved” there was a “grassy knoll shot,” tests conducted in Dealey Plaza showed that the duration of actual echoes was only ¼ to ½ second in length. There are arguments on both sides as to the validity of the acoustical evidence. But I’ll present a new one—the evidence of the dictabelt itself is valid, but other evidence has been misrepresented (i.e., the HSCA diagram of the microphone placement) to make it appear as if the dictabelt evidence is not valid.